American manned high-speed research aircraft. Flown 1947-1953. The D-558-I "Skystreaks" were among the early transonic research airplanes like the X-1, X-4, X-5, and XF-92A. Three of the single-seat, straight-wing aircraft flew in a joint program involving the National Advisory Committee for Aeronautics (NACA), with its flight research done at the NACA's Muroc Flight Test Unit in Calif., redesignated in 1949 the High-Speed Flight Research Station; the Navy-Marine Corps; and the Douglas Aircraft Co. from 1947 to 1953. In the process, the Skystreaks managed to set a couple of world speed records. The division of responsibility among the partners was that Douglas flew a contractor program on the first Skystreak to investigate its performance, handled major maintenance and performed any modifications. The NACA unit at Muroc (later Edwards Air Force Base), today called the NASA Dryden Flight Research Center, purchased fuel and oil from the Army Air Forces (Air Force after September 1947), provided and installed instrumentation, performed the flight research on the number two and three aircraft, and took care of routine flight maintenance and inspection on them. The Navy paid the expenses of Douglas Aircraft, including engine overhaul and replacement, and its pilots did some of the flying. The (Roman numeral) I in the aircraft's designation referred to the fact that the Skystreak was the phase-one version of what had originally been conceived as a three-phase program, with the phase-two aircraft having swept wings. The third phase, which never came to fruition, would have involved constructing a mock-up of a combat-type aircraft embodying the results from the testing of the phase one and two aircraft. The need for transonic research airplanes grew out of two conditions that existed in the early 1940s. One was the absence of accurate wind tunnel data for the speed range from roughly Mach 0.8 to 1.2. The other was the fact that fighter aircraft like the P-38 "Lightning" were approaching these speeds in dives and breaking apart from the effects of compressibility-increased density and disturbed airflow as the speed approached that of sound, creating shock waves. People in the aeronautics community-especially the NACA, the Army Air Forces (AAF), and the Navy-agreed on the need for a research airplane with enough structural strength to withstand compressibility effects in the transonic region. The AAF preferred a rocket-powered aircraft and funded the X-1, while the NACA and Navy preferred a more conservative design and pursued the D-558, with the NACA also supporting the X-1 research. The Navy contracted with Douglas to design the airplane, and in the course of the design process, the D-558 came to be divided into two separate phases, with phase one being a straight-wing turbojet aircraft and phase two consisting of a swept-wing design with turbojet and rocket propulsion. The Douglas design team, headed by Edward H. Heinemann, used NACA information and airfoil shapes. It tested its models in NACA and California Institute of Technology wind tunnels. And it relied on NACA recommendations, such as putting the horizontal stabilizer of the D-558-I high on the vertical tail to avoid the wake from the wing. As with the X-1, the D-558-1 also featured, at NACA suggestion, a horizontal stabilizer that was thinner than the wing so as to avoid simultaneous shock wave effects for the wing and horizontal tail. Also at NACA suggestion and like the X-1, the stabilizer was movable in flight to provide pitch (nose up or down) control when shock waves made the elevators ineffective. What the Skystreak lacked was an ejection seat. The design team had considered one, but given the technology of the day, the team discovered that the force necessary to propel the seat and pilot higher than the vertical tail exceeded the pilot's physiological limits. Hence, Douglas provided instead a jettisonable nose capsule from which the pilot could bail out if the airplane were high enough. When Commander Caldwell temporarily set the world's speed record in NACA 140, the Navy Bureau of Aeronautics stated in a message to the NACA: "A great measure of the credit for the success of the D-558 airplane speed record flight is due to the NACA. The highly important introductory research and investigation program leading to recommendations on airplane configuration problems was essential in the development of this airplane." Family: Rocketplane, Suborbital, US Rocketplanes. Country: USA. Agency: USN, Douglas. Bibliography: 17, 4333, 459. 1947 April 14 - . D-558-I first flight. - . Crew: May. Nation: USA. Related Persons: May. Spacecraft: D-558-1. Douglas pilot Eugene F. May flew the number one Skystreak for the first time on April 14, 1947, at Muroc Army Airfield (later renamed Edwards Air Force Base) in Calif. The goals of the program were to investigate the operation of a straight-wing configuration in the lower third of the transonic speed range (which extended from roughly 0.7 to 1.3 times the speed of sound). 1949 November 22 - . Launch Site: Edwards. Launch Complex: Edwards. D-558 first supersonic flight. - . Nation: USA. Class: Manned. Type: Manned rocketplane. Spacecraft Bus: D-558-1. Spacecraft: D-558-2. D-558-II Skyrocket exceeded the speed of sound at Edwards AFB, Calif. It was powered by both a Westinghouse J-34 turbojet engine and a Reaction Motors, Inc. rocket motor..
1951 June 11 - . Launch Site: Edwards. Launch Complex: Edwards. D-558 test flight. - . Crew: Bridgeman. Nation: USA. Related Persons: Bridgeman. Class: Manned. Type: Manned rocketplane. Spacecraft Bus: D-558-1. Spacecraft: D-558-2. 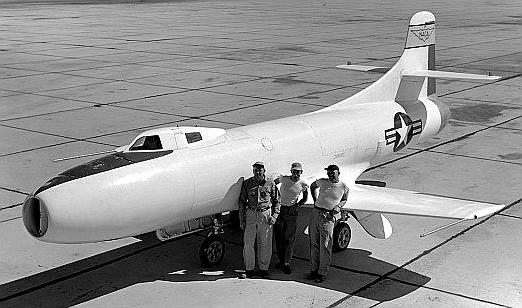 Navy D-558-II Douglas Sky-rocket, flown by test pilot William Bridgeman, set a new unofficial airplane speed and altitude record at Edwards AFB, Muroc Dry Lake, Calif.; speed estimated at more than 1,200 mph; altitude estimated 70,000 feet..
1951 August 15 - . Launch Site: Edwards. Launch Complex: Edwards. D-558 reaches record altitude. - . Crew: Bridgeman. Nation: USA. Related Persons: Bridgeman. Class: Manned. Type: Manned rocketplane. Spacecraft Bus: D-558-1. Spacecraft: D-558-2. William Bridgeman flew the D-558-II Skyrocket to 79,494 feet, highest altitude attained by a human being to date..
1953 August 21 - . Launch Site: Edwards. Launch Complex: Edwards. D-558 record altitude. - . Nation: USA. Class: Manned. Type: Manned rocketplane. Spacecraft Bus: D-558-1. Spacecraft: D-558-2. Flying Douglas D-558-II (No. 2) Skyrocket research aircraft which had been launched from a B-29 Superfortress at an altitude of 34,000 feet, Lt. Col. Marion E. Carl, USMC, attained an altitude of 83,235 feet at Edwards AFB, Calif..